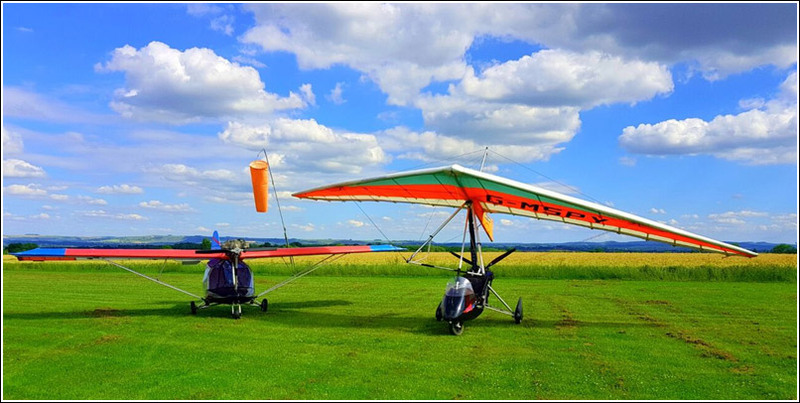 The AX2000 is a high wing side-by-side seat, centrally located stick controlled monoplane. This popular aircraft has been designed with the beginner in mind, being very forgiving yet giving very lively performance especially when it comes to operating from short unprepared fields. Experience has shown that students who learn on this aircraft find conversion to other aircraft much easier. This is due firstly to the requirement to use the rudder pedals in order to fly the aircraft more precisely, and secondly, the light control forces normally only found in more advanced type aircraft. This makes for a more relaxed and less strenuous flight even in turbulent conditions. The main structure is made from aluminium alloy tube with steel fittings and covered with polyester (sailcloth) fabric. The aerofoil section is defined by the use of pre-formed aluminium ribs. The undercarriage has an independent sprung shock absorbing system on each of the large wheel assemblies. The fuselage keel member is fitted with a HKS DCDI engine, reduction drive and tractor propeller. This 4-stroke, 2 cylinder horizontally opposed engine has dual spark ignition, magneto and an electric starter system. The engine is oil colled and the cylinder barrels are free air cooled. It uses normal unleaded petrol but can operate on aviation gasoline (AVGAS) as well. It is a fun aircraft to fly where you actually feel part of the aircraft and the flying environment. Often described as the motorcycle of the sky, it is very manouverable with an unequalled open cockpit view of the world below. The trike is fitted with a rear mounted Rotax 912, 80 hp engine, reduction drive and pusher propeller. This 4-stroke, 4 cylinder horizontally opposed engine has dual spark ignition, magneto, dry sump lubrication and electric starter system. The cylinder heads are liquid cooled and the barrels are ram-air-cooled. It uses normal unleaded petrol but can operate on aviation gasoline (AVGAS) also.